When I arrived in Bucine on Wednesday, I thought my picture book was just about ready to go. I’d finish it off and then write a couple of essays, and at least three Writeaways blog posts. I’ve always been a fast writer and I had a whole week. Netflix isn’t working, I don’t have a TV, and it’s pretty quiet here. The big excitement of the day is when the rugged bread man, Fabio, yes that’s his name, drives up with a truck full of carbs. On a really big day, we might go to the grocery. But my book, now tentatively titled, has demanded more time than I imagined. Apparently my ability to rhyme house with mouse and tail with sale is not enough to seal the deal (you can’t stop me now). We are all here to write. And we do that in just about every corner of the villas. 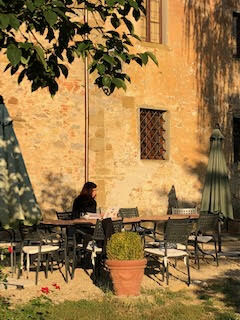 Jenn prefers outside, Gene spreads out at the big table in the hall of Villa Cini, while his wife Maddy, a full-time writer, writes upstairs. 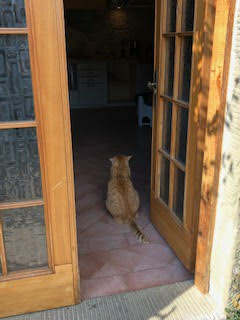 I prefer my room because it seems to be the warmest place on the property. My gut says Mimi and John, knowing about my thin Florida blood, thought of that when they assigned the spaces. Some of us write more than others. Karen shut herself in her room and skipped lunch, writing 20 pages in one day. Gene, who just started writing at Writeaways France, cranked out 5,122 words. They weren’t bragging, just doing what they came here for. I’m not nearly as prolific, but I’ve written more here in a week, for myself, than I have in a long time, and I’ve thought about my writing and my place as a writer more than I have in decades. We’re here to write, but also to read. Every day for three hours, we meet for workshop, reading our pages to each other around the long patio table or inside on the Villa’s eclectic mix of plush and straight back chairs. It’s hard to explain how it’s so easy to share something so personal, and sometimes raw, with people you just met. I think that’s what “It takes a villa” means. In a private conference, Mimi helps me understand about rhythm in poetry and that no matter how much I love a word, if it throws off the rhythm, I should try and find a new one. In another conference, John asks about my mouse’s motive. Apparently, “He wants cheese” isn’t enough. He’s right. I vow to make my mouse more interesting. I have one more day to get my book ready for our final reading. I hope my friends (because that’s who they are now) can see their suggestions and “what ifs” in my book.